TAMPA, Fla. – USL PRO unveiled its 2015 competition format today, featuring a two-conference alignment to further promote regional rivalries following the league’s unprecedented off-season growth. USL PRO has expanded to 24 teams for its highly-anticipated 2015 season with the establishment of professional soccer in new markets along with the addition of seven MLS owned and operated clubs. 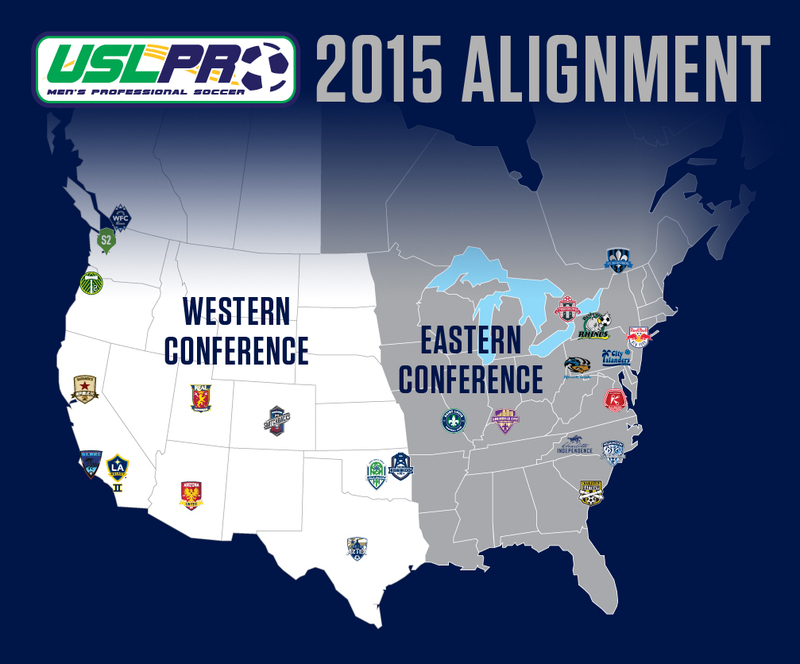 The full 2015 USL PRO schedule will be announced later this month. USL PRO will be split into 12-team Eastern and Western Conferences in 2015, with teams facing each of their conference opponents at least twice during the 28-game regular season schedule. The additional six games (beyond the standard home and away against the other 11 intra-conference foes) will be matchups against geographic rivals resulting in several cross-conference contests. “Transitioning to a conference-based structure is consistent with our long-term growth strategy and enabled by the rapid expansion of the league,” USL PRO Executive Vice President Jake Edwards said. “This new format will promote regional rivalries, allowing fans greater opportunity to support their clubs home and away as the league continues to bring its brand of professional soccer to enthusiastic markets throughout the U.S. and Canada. The 2015 season will also bring changes to USL PRO’s single-elimination playoff format with the top six finishers in each conference moving on to the four-week postseason. Teams will be seeded No. 1 through No. 6 in each conference, with the top two seeds receiving first-round byes and the No. 3 seed hosting the No. 6 seed and the No. 4 seed hosting the No. 5 seed. The winner of the No. 3 vs. No. 6 game will then travel to face the No. 2 seed, and the winner of the No. 4 vs. No. 5 game will travel to face the No. 1 seed. The winners will meet in the Eastern & Western Conference Championship games with the remaining two teams advancing to square off in the 2015 USL PRO Championship, hosted by the higher seeded club. There are a total of six awards to be earned in the 2015 USL PRO season. In addition to the highest honor of 2015 USL PRO Champions – awarded to the winner of the league’s post-season tournament – USL PRO will officially honor the Eastern Conference & Western Conference champions for both the regular season and the playoffs, as well as the overall USL PRO Regular Season Champion – the team earning the most regular season points.